Gospel singer Eko Dydda on Friday was in some rather unexpected turf after word started doing rounds online that he had kicked his wife and kids out. According to the source, the rapper’s wife Cynthia Ayugi alias Galia and his two musician sons, Amblessed Dydda and Keepitreal Dydda were out in the cold following cheating rumours. The source claimed also the singer had warned his wife and kids not to speak about the issue. 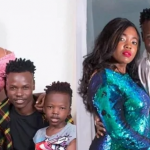 The wife is alleged to have moved to a relative’s place in Nairobi’s Jericho Estate, as Eko Dydda brought in another new woman. Not me But speaking in an interview recently, the born again rapper shut down the rumours saying he’s not that kind of man. “You know me. I cannot dare do all that which is being alleged online. My wife and children are with me, and I do not know where that bad rumor came from. I, however, leave it to God to fight for me,” He said in an interview with Edaily. The post Eko Dydda finally speaks after being accused of kicking wife, two sons out of house and bringing another woman appeared first on Ghafla! Kenya.